The plan from the beginning was for Robert Arvie to get his college degree and perhaps return to Opelousas High and start his coaching career. His career compass instead pointed north of St. Landry Parish and earlier this month Arvie, now a 26-year coaching veteran, took his Richwood High-Monroe team to the Class 3A state championship game. It’s been somewhat of a long and winding coaching journey for Arvie, since he left USL (now UL) in 1992 with a college degree, after playing football for the Ragin’ Cajuns. 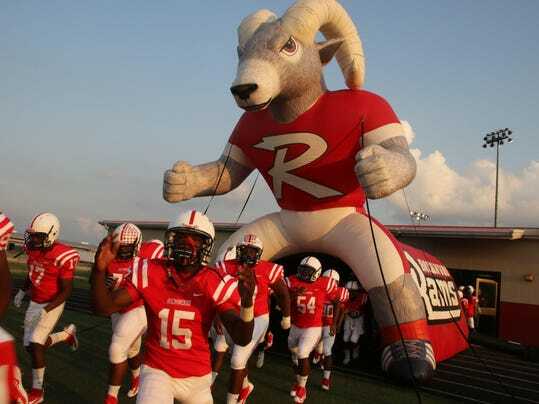 Since then he’s become a familiar name in the Monroe and Shreveport area, coaching twice at Ruston, then at Ouachita, Neville, Bastrop Wossman, and Woodlawn-Shreveport, where he was head coach for one season before taking the Richwood job in 2013. It only took one telephone call, Arvie said on Friday during a telephone interview, to launch his coaching career. He was still completing final exams at USL when he dialed then Opelousas High head football coach Larry Dauterive and asked for a job. Now more than a quarter of a century later, Arvie remembers that phone conversation which eventually changed his life. “It was on a Friday and I called Coach Dauterive and told him I wanted to coach and come back to OHS where I played football. He told me there wasn’t room for me on his staff, that no one was leaving. “He told me to hold tight and he would do what he could to help. He called me back and told me I had a job interview set up for that Monday at Ruston High. I still had three finals to take and I told myself I better pass them if I wanted that job,” said Arvie. Arvie received the Ruston job after a flawless interview with the staff there and it began the fulfillment of a plan that incubated as a youth league baseball player in Opelousas. “I just think growing up in Opelousas with the Little League program I had some great coaches who were great role models. Then as I grew older, I thought I’d like to coach in high school and I wanted to do that in Opelousas,” said Arvie. Arvie said he also thought briefly about the priesthood, after watching Father McKnight at Holy Ghost in Opelousas work with other youths. At Opelousas, Arvie was a sophomore when Opelousas in 1984 played Ruston at Donald Gardner Stadium in a state football quarterfinal. It was a tumultuous season. OHS was 2-2 and then head coach Mike Ortego was dismissed and his assistant, Mickey Autrey took over and OHS won eight straight. Arvie said Autrey’s young assistant, Mac Barousse, took over the offense and installed a passing game that helped Arvie’s receiving skills, something that enabled him to capture the attention of college coaches, including USL’s Nelson Stokley. After years as an assistant coach and winning two state girls track championships at Wossman, Arvie said he became a head football coach for the first time — at Woodlawn in 2012. “I had a chance in 2005 to become a head coach at Caldwell Parish, but I would have taken a pay cut to do so,” he said. In 2012, Woodawn started 0-5, Arvie said, but the team won four of the last five games and captured a district title for the first time since 1990. Then in 2013 he received a call to return to Richwood — this time as a head coach. The facilities at Richwood, Arvie said, were superior to those at Woodlawn. There was a field house extension and a home field on campus. In Shreveport, Arvie said the home games were played at various sites around the city. Richwood closed down in 1987 and Arvie said the school reopened again in 2001 and the objective at the school was two combine the two factions — the new and old Richwood supporters — into a unified community. That had begun to happen by the time he arrived and the seniors on the 2017 football team helped accomplish that. “This group was undefeated throughout middle and junior high and then again as freshmen at Richwood. The talk all along was this was going to be the group that got us to a championship,” he said. Richwood (11-4) finished runner-up after losing to West Feliciana in the finals three weeks ago. Arvie said from his perspective, successful coaching can be defined by hard work. “These kids today are no different than any other. You can’t fool them. If you come to work every day and they see that effort, they are going to follow,” said Arvie. Arvie and his wife Stephanie, a Duson native he met during his junior year at USL, are planning to spend part of the Christmas break in the Opelousas area. They have a teenage daughter who attends school in the Monroe school system and Arvie credits his wife for helping him mature. “She’s the one that made me straighten up. I began to focus more on my studies the last two years of college and I saw that my main goal was to get my degree. I took a bunch of hours my last two years and in the summer in order to graduate. “I grew up and then I started to focus on what I really wanted to do,” he said. Click here for the Athletic Network profile of Robert Arvie, Football 1987-91.